On May 2 the Ministry of Defence organized an EU Presidency conference on cyberspace security in Stefánia Palace, Budapest, where participants discussed how the international community can respond to the cyberspace having become an independent theatre of war. 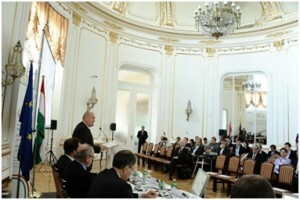 The keynote address was delivered by Defence Minister Dr. Csaba Hende. In his speech, Dr. Csaba Hende stressed that the issue of cyber security has become one of the key topics in international discourse on security policy. The Defence Minister pointed out that any technical achievement can be used with malicious intent, to accomplish negative aims. He emphasized that modern-day societies are increasingly depending on IT systems, so we must pay special attention to matters of cyber security. The minister said that cyber attacks may inflict serious damage on any country, as their consequences might also affect the energy supply, water resources, transport networks, banks and the financial sector as well as communications systems. This means that the attacks carried out via the computer networks may have actual physical outcomes. Dr. Csaba Hende noted that we have already seen some specific examples of state-on-state wars where the digital battlefield played a major role. Speaking about current dangers, he also mentioned the issue of protecting intellectual property, and gave an example of carrying out cyber attacks with the intent to acquire data and descriptions of strategically important weapon systems or military equipment. (from left to right): Gábor Márki, MoD Deputy State Secretary for Defence Economy; Defence Minister Dr. Csaba Hende; Gábor Iklódy, NATO’s Assistant Secretary General; Péter Siklósi, MoD Deputy State Secretary for Defence Policy and Planning. Csaba Hende said we have to realize that today the cyberspace is another battlefield besides land, water and air. He cited some specific examples from recent years like the orchestrated cyber attacks against Estonia four years ago and the events of the Georgian-Russian war in 2008. The minister pointed out that in order to be able to properly defend ourselves against this type of threat, we have to develop the necessary technology and we need excellently trained teams of experts, as well as an extensive cooperation based on a comprehensive approach. This calls for closer cooperation within the European Union involving the regular exchange of lessons learned and knowledge transfer. In this respect, Dr. Csaba Hende underlined the outstanding importance of transatlantic partnership. Cyber attacks must be prevented, detected, and fended off in line with NATO’s newly adopted Strategic Concept. He also pointed out that Hungarian Ambassador Gábor Iklódy is now NATO’s Assistant Secretary General for Emerging Security Challenges and the head of the ESC Division. Csaba Hende expressed his hope that the conference would facilitate the achievement of the aforementioned important objectives and more efficient cyber defence. Following the keynote speech, Gábor Iklódy, NATO’s Assistant Secretary General for Emerging Security Challenges, MEP Tunne Kelam, Giuseppe Santomartino, the head of the EU Military Staff CIS Directorate, Ilmar Tamm, the director of the NATO Cooperative Cyber Defence Centre of Excellence (NATO CCD COE) and several subject matter experts held presentations at the conference.